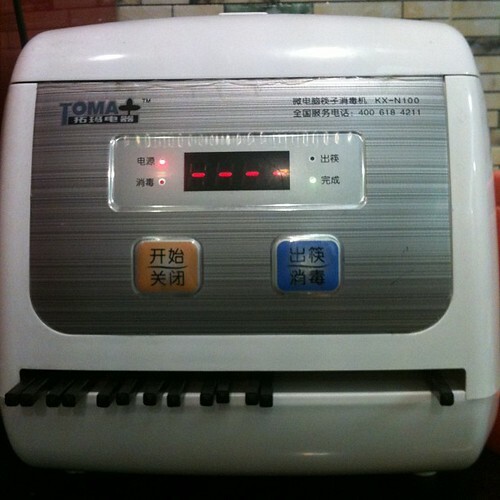 #chopstick steriliser in a small #noodle #shop in #shenzhen #china, a photo by Marcel_Ekkel on Flickr. Traveling around Asia you often run into surprising inventions. In many restaurants and smaller eateries the tea that is served is initially used to "clean" the bowls and chopsticks. This habit makes sure that the utensils used actually are clean. Quite an interesting ritual to see. People sit down and the next thing you see is cans of tea being spread around, chopsticks, spoons and bowls being rinsed. Restaurants often provide a bigger bowl for the "waste water". A few days ago I was in Shenzhen, and when having dinner at a local noodle joint I discovered the above machine in the corner. The owner of the place started to pull out things that later seem to be the chopsticks. After more closely inspecting the machine it seems to be some sort of steriliser making sure that shop visitors have clean chopsticks.